As promised here are some of my other models I am thinking of using for my application. I noticed how they switched the amount needed from 6 down to 4, which I think is very nice as it allows me to only show off my strongest models. Two of these entries will be the Chaos Lord and the Firebelly which are both being painted just for this, here are some choices for the other two. 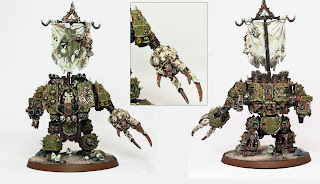 The Forge World Nurgle Chaos Dreadnought. I think this guy is going to make the cut. He has one of my highest scores on CMoN, was painted up for a past application to Forge World and was featured on the Games Workshop website as a runner up in one of their painting competitions. He shows off my ability to paint larger models as well as vehicles and my attention to detail, because let me assure you, there is a ton of detail sculpted on this guy. Valthex is another favorite of mine. He is 100% converted so it also shows off my ability to make convincing and cool looking conversions (which I know 'Eavy Metal doesn't do often, but sometimes they do). I feel like he also has a lot of effects on him that are good for this application; glow effects, power weapon effects, and free hand on the cloak and shoulder pad. I would retake the photos of him to try and get more of him in focus and be more evenly lit. It will either be him or Valthex, not both, as they are both Astral Claws. This guy again shows off most of the same effects as Valthex with even more intricate free hand. I would fix the mold line on the top of the sword and maybe add something to his base but that's all. This guy most likely won't be chosen. I already have two Fantasy entries and he wasn't painted to the highest standards. My Tomb Kings army is mostly table top quality with a few gems in it. The only reason this guy is being considered is because he currently holds my highest score on CMoN. I think that has more to do with the conversion then the paint job. So those are my top contenders for the last 2 spots. Which ones do you guys think should make the cut? Let me know, and be critical. Feel free to give suggestions on way to improve any of these models to make them worthy of sending to GW.